One last thing. This rendition is made with ground turkey, which is hardly traditional, although you can’t really tell the difference. Honestly. That said, we’re not going to try to stop you from making it with ground beef. As if we could stop you. 1. Heat the oil in a large Dutch oven or soup pot over medium-high heat. Add the chopped onion and cook, stirring, until softened, about 5 minutes. Add the garlic and cook for 30 seconds. Add the turkey and cook, breaking it up with a wooden spoon into small pieces, until just cooked through and no longer pink, about 5 minutes. 2. Add the bell peppers and cook until they begin to soften, about 2 minutes. Add the chili powder, cocoa, paprika, cumin, oregano (if using), cinnamon, allspice, cayenne pepper, salt, black pepper, and cloves and cook, stirring, until fragrant, about 1 minute. 3. Add the tomato sauce, tomatoes with their juice, water, molasses, and bay leaf and bring to a boil. Reduce the heat to low and simmer gently, partially covered, until the mixture has thickened considerably but is still somewhat soupy, about 2 hours. 4. Remove and discard the bay leaf. 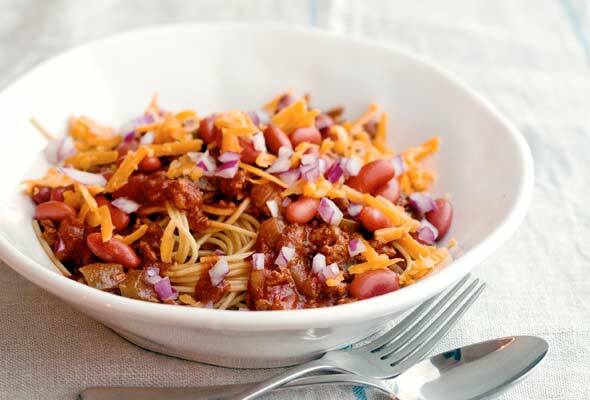 Serve the chili over the spaghetti, topped with the kidney beans, cheese, and diced red onion. I’ve never made a turkey chili with cocoa before, but I really enjoyed the warm notes it added to the flavor. I thought the cumin came out a little strong, but all the other spices seemed to blend in just fine. I did simmer the pot with the lid half on, just to keep the liquid from evaporating too quickly, which worked. With all the spices, I didn’t even miss the ground beef. And I enjoyed it over spaghetti, but also on its own, with a baguette, over salad, and mixed in with spaghetti squash. As with most chilis, the flavors deepened the next day, but it was delicious hot out of the pot. Definitely a winner, and I am going to mix up a batch of the spices to keep in a jar so I don’t have to measure so much next time. I was pleasantly surprised at the depth and richness of flavor produced by this recipe. I was wary of the ground turkey and by what seemed an excessive amount of green pepper, but the wide spectrum of spices, the cocoa powder and the molasses produced a hearty and satisfying chili. I included the oregano and the bay leaf, and also put the kidney beans into the chili, since I prefer my beans to be warmed. I served the chili over multigrain spaghetti and topped it with cheese and red onion — delicious! I also ate leftovers the following day without accompaniments and still loved it. 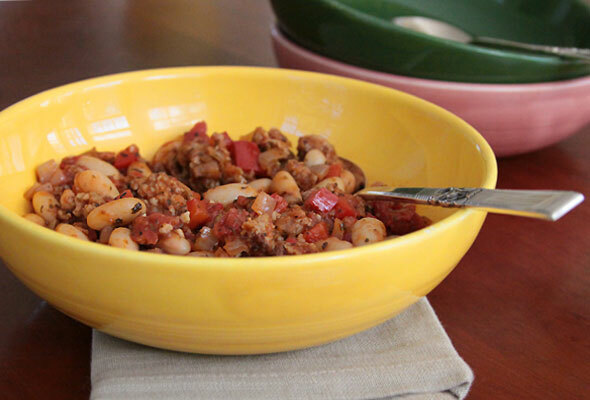 This just might become my standard chili recipe since it is so healthy and tasty. This smells just like the Cincinnati chili I’ve made for years. I think the version I make is pretty authentic — it’s just like the one served at a local restaurant that specializes in it. This version is flavorful, slightly spicy, but a little thicker than I’d like. I’d prefer broth in place of water, and more of it. Also, I think the beans should just be added to the chili — otherwise, it’s an extra step to heat them before adding them to the pile of pasta. 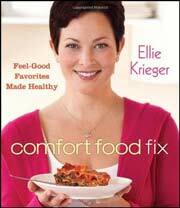 I am a dietitian with utmost respect for Ellie Krieger and her recipes. This is a perfect example of reduced fat combined with tons of flavor. I knew that Cincinnati Chili would be different from the Texas varieties that I usually make, but I thought that this healthy dish was worth a try. Glad I did. The flavors came together in a delicious way, though it’s important to note that the flavors are not at all like Texas chili. I followed the recipe as written and included all of the spices, even the ones that I am not usually a fan of, like allspice and cloves. It was perfect. Served it on whole wheat spaghetti and used all of the toppings as directed. I used reduced-sodium tomatoes and found that the chili was perfectly seasoned. I am thinking about visiting Cincinnati just to do some chili research! I enjoyed making the Cincinnati Turkey Chili. It was quick and easy to prepare, and tasted as though a lot of effort had gone into it. I would say it benefits from being made in advance and left for a while before eating. The recipe was straightforward. I did include the dried oregano and the bay leaf, and I cooked it in a partially covered pan. I don’t know what a dutch oven is, and I don’t have a soup pot, so I used a large saucepan but found I needed to stir from time to time. A good preparation tip would be to put the herbs and spices all together in a little dish, ready to add all at once after the peppers. Instead I had the jars all lined up and measured each as I went, which meant some of the spices came close to being a bit burnt before all the others were added, and although More experienced cooks would probably do this as a matter of course, I didn’t think of it until afterwards. I would use less cocoa next time if I was to serve it straight away, as I found I could taste it. However, leaving it for a few hours, then reheating and eating, the taste of the cocoa wasn’t nearly so prominent. Cincinnati Chili Recipe © 2011 Ellie Krieger. Photo © 2011 Quentin Bacon. All rights reserved. All recipes and photos used with permission of the publisher. I love the cinnamon, allspice and cloves in that chili. I’ve never seen that before, but it sure sounds good. This is one I’m going to have to try out! I just made a similar recipe last night for my kids – I served it over whole grain pasta and they loved it. I used unsweetened chocolate instead of cocoa and a little bit of vinegar. This recipe looks delicious and healthy, however, as an ex-Cincinnatian, I can assure you that green peppers never make it into the iconic Cincinnati Chili Parlor dish, let alone ground turkey! We sort of danced around the heresy of the turkey in the note above the recipe, Christine, although you caught us. And veeeerrrrrrry good to know about the bell peppers. We’ve seen various recipes alternatively rely on them or ignore them, so we’re glad to have the info straight from the source! Many thanks. Back in the days before so much airport security I used to deliberately schedule flights through Cincinnati, giving myself a 2- to 3-hour layover. The plan was land, grab cab, rush to Dixie Chili Parlor, stuff down 4 or 5 chili dawgs or a 4-way, then hotfoot it back to the airport to catch my flight out. I always wondered what my outbound seatmates thought of this brilliant plan…so thanks, I’ll make a batch this week. All I can say is I’m glad I never made a habit of flying out of Cincinnati, Rick. This dish has turned into a monthly staple in our house. My whole life I had never even heard of Cincinnati chili. So many spices add so much flavor to this recipe and there is NOTHING I have ever changed. I go 5way with this every time and recommend you do the same. Honestly, I could eat this dish every day for the rest of my life and be forever happy! Very good recipe, thank you! Jeff, you are more than welcome, sir.